You can do a lot with Topics! This article goes over each of the action buttons available when you are viewing a topic on a TOPICS tab or in the main TOPICS STREAM. Set Reminder: Have you ever clicked on a notification to read a topic, then realized it was way to long to read “now” because you were in a hurry? Click the Reminder button and we will send you a notification later to remind you to check out the topic. There is also a reminder button for each reply, in case you want the notification to link directly to a particular comment on the topic. By default, we send the notification an hour after you click the reminder button, but you can change the duration in Notification Settings. Create a Task: You can create a task from a topic or reply. When you do this, the text from the selected topic description or reply will be pasted into the task as a “transcript”. Copy Link to Topic: Clicking this button will pop up a URL that you can use to reference this topic in other parts of the application. For example, in chat, or from a comment on another topic. When people click the link, this topic will slide in for them to view (as long as they have access to the team/forum in which the topic resides). Toggle Archived: Depending on whether the topic is already archived or not, you can use this menu option to archive the post so that it disappears from the active topic list, or you can unarchive it to bring it back into view. You can view just the archived topics from the ellipses button up in the top header bar. Print (beta): Print is currently available in most browsers, and we are looking into adding it to the desktop app as well. Subscribe/Unsubscribe to Notifications: If you create a topic, you are automatically subscribed to notifications of any added comments or votes. If you comment on somebody else’s topic, you are automatically subscribed as well. 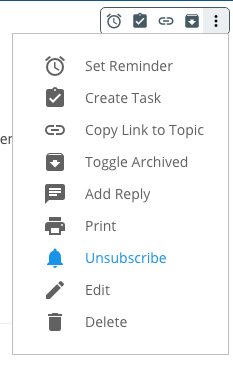 Use this button to unsubscribe from a post, or to manually subscribe to a post that you haven’t participated in yet. Note: You can also subscribe to all topics in a team or forum from the ellipses button up in the top header bar. Edit: This button will only be enabled for the creator of the topic, or the system admin. Use it to edit the topic content or add/remove attachments. Delete: This button will only be enabled for the creator of the topic, or the system admin. Use it to completely delete the topic and any attached comments.